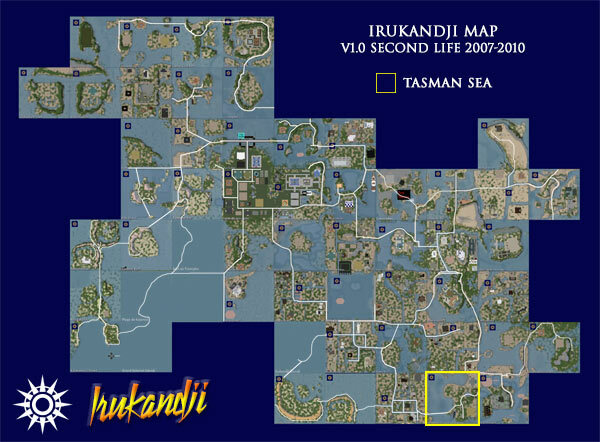 The simulator, Tasman Sea is a light residential region in Second Life, located in Aboyo State in southeast Irukandji. 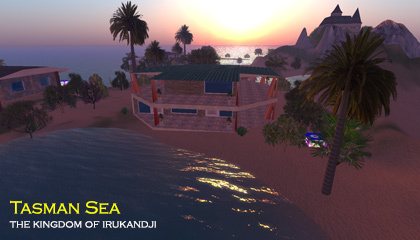 A shallow sea fills the western side of the sim where it adjoins Manatu Island, and in the north along the face of Mount Aboyo Island. The eastern half of Tasman Sea contains a rolling landmass with dunes and flat grassland, which abuts the beach at Old Fort Island. The Aboyo River flows through Mount Aboyo, spilling into Tasman Sea, while the Trans Irukandji Causeway traversed Tasman Sea from east to west from Manatu Island to Old Fort Island. Other regions that adjoin Tasman Sea are Tiamo Reef to the northwest and Toraboyo Beach to the northeast. Two residents occupied the eastern beaches throughout much of the life of the region.